Vancouver, B.C., September 26, 2018 - Adamera Minerals Corp. (TSX V: ADZ; OTC: DDNFF) announces that diamond drill hole OS18-02 intersected 19.4 g/t gold over 1.07 metres on the Overlook project in Washington State. The extent of the high-grade gold mineralization is not yet known as the drill hole terminated in the zone. Drill planning to determine the extent of the mineralization is underway. Results for Oversight drill holes OS18-01 and OS18-02 are reported in Table 1 below. Drill hole OS18-02 was drilled at -50o towards the east, terminating at the maximum depth capacity of the equipment. 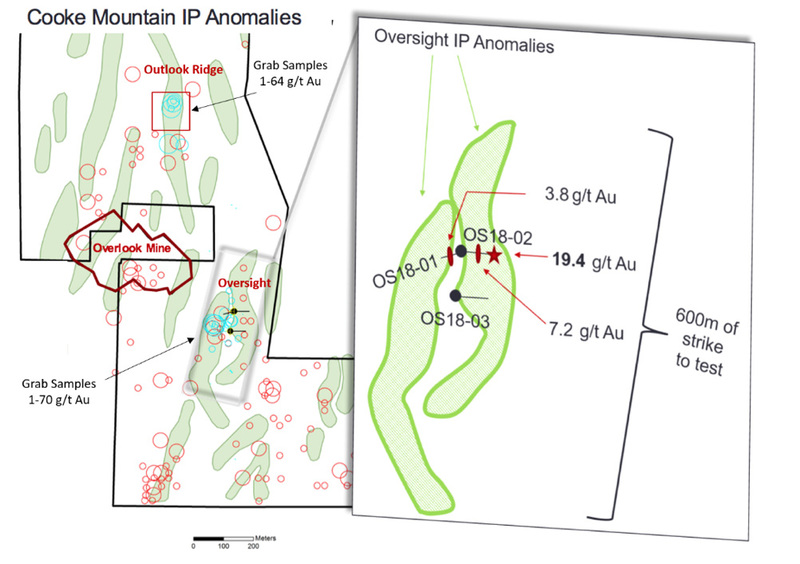 It was designed to test a 600 metre long, 70 metre wide north-south trending IP anomaly with coincident anomalous gold in soil and rock geochemistry (see Figure 1). The hole traversed 50 metres of the western side of the IP anomaly. The remaining 20 metres of the anomaly will be tested by drilling beyond the maximum depth of hole OS18-02. The 19.4 g/t gold intercept was from 78.2 to 79.3 metres down hole. The gold occurs in fine grained, silicified clastic rocks with an estimated 5% disseminated sulfides. A zone of intense alteration was intersected immediately before the mineralized zone (see photo below). Other intersections of interest in this hole are shown below in Table 1. The dip, strike and extent of the mineralized zone is not yet known. For further discussion on the significance of these results (click here) for a short narrated video. immediately before mineralized zone with 19.4 g/t gold. “We have just begun testing these IP targets, and so far, they appear to be leading us to gold mineralization. The alteration suggests they are conduits for fluid flow which may host previously unknown gold mineralization. The many IP anomalies on the property, especially those proximal to known gold deposits and/or gold in soils undoubtedly represent high quality targets for the Company,” says Mark Kolebaba President and CEO of Adamera. Drill hole OS18-01 on Oversight was drilled at -50o towards the west, to test a second IP anomaly (located west of OS18-02). At this location the IP anomaly is approximately 80m wide. 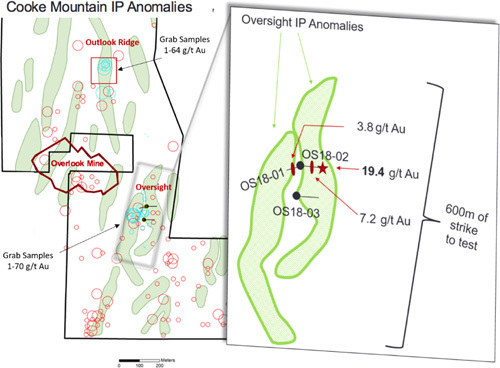 The hole intersected several gold bearing zones, including, at 21.65 to 24.38 metres down hole, a 2.7 metre zone with 2 g/t Au (including 3.8 g/t Au over 0.7 metres). As drill hole OS18-01 only tested the eastern 20 metres of the IP target, additional drilling is planned. Core samples from a third drill hole, OS18-03 shown in Figure 1 have been submitted to the laboratory for analysis. The hole also tests the western side of the IP anomaly tested by OS18-02. While the company was waiting for assay results for the Oversight property, the drill was moved to the Lamefoot South property. The drill is currently testing a Lamefoot South target and will be moved back to Oversight upon completion of the Lamefoot South hole.